I thought I had better let our readers know that we are not going to be doing any new posts this week because we are busy counting inventory for our fiscal year end, and I expect this to take all of this week. Large and Small QueensThe 1954-62 Wilding IssueThe 1953-62 Karsh IssueThe 1911-27 Admiral Issue Enjoy, and we will be back next week. Today's post will deal with the second commemorative issue of 1927 that was released on the same day as the previous set, the 60th Anniversary of Confederation Issue. Collectors call it the Historical Issue because it depicts historical figures only and includes three of the fathers of confederation who are never seen again on any Canadian stamp. 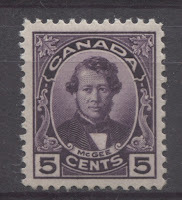 The issue was actually intended to be released originally in 1926 when it was printed, but for some strange reason, the Post Office Department decided to hold it back and release it on the same day as the Confederation Issue, June 29, 1927. 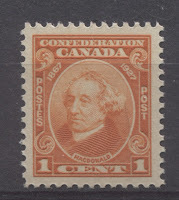 The points of interest with this issue are much the same as the Confederation issue, but not quite as extensive. Consequently for an area of specialization, this issue will often be collected with the confederation issue. This is my last detailed post on the ever-popular Admiral Issue of 1911-1928. Today's post will deal with the War Tax stamps that were first issued in 1915. In that year, as a measure to finance involvement in World War I, a 1c war tax was levied on all lettermail, increasing the current postage rates. Initially, it was decided to issue separate postage stamps for the actual war tax itself and then later for the war tax and the postage. Finally, in 1918, these stamps were discontinued and the 3c brown was issued to cover both the basic postage and the war tax, without any mention of the said tax.